Move over, Brangelina – a new power couple is rocking the newswires! Yesterday Germany’s Angela Merkel and France’s Nicholas Sarkozy – dubbed as “Merkozy” – boosted risk appetite by calling for stricter measures in the EU treaty. In a move to calm fears on the euro zone crisis, Merkel and Sarkozy both proposed to change the EU treaty in order to put more pressure on EU states to reign in their budget deficit. One of the more striking proposals is an automatic sanction on EU member states that have budget deficits higher than 3% of GDP. For comparison, Greece’s budget deficit was at 10.60% of GDP in 2010, while Italy’s deficit was at 4.60% of GDP. Merkozy called for a “harmonized golden rule” on deficits, which would likely force some states to prioritize budget deficits in their constitutions. Sarkozy said that they plan to get the 27 EU states on board with the idea and discuss the fine print by March, but they would also settle for just the 17 euro zone economies and let others sign on a voluntary basis. At this time, it looks like the Merkozy tandem wants European leaders to provide investors the assurance they need as soon as they can. 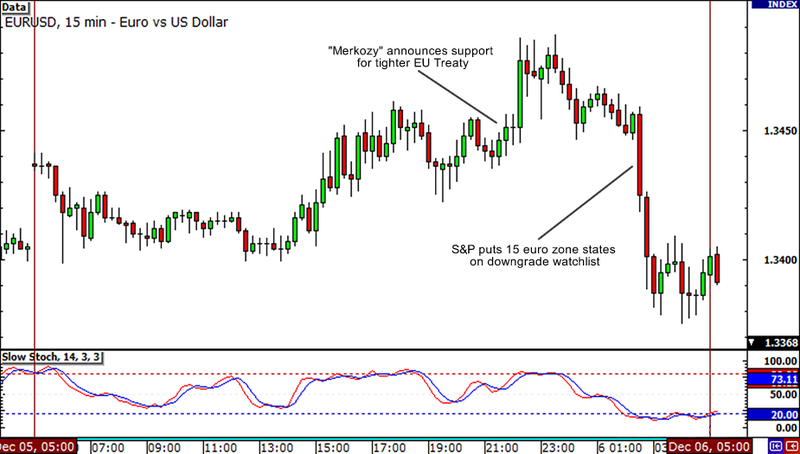 The news initially boosted the euro, allowing it to climb back up to retest the 1.3500 handle. However, all that changed when credit rating agency S&P warned on the possibility of multiple ratings downgrades across the euro zone. Apparently, AAA-rated countries like Germany, Finland, Austria, and the Netherlands could all get hit with one-level cuts, while France and eight other members could be bumped down by two levels. By the end of the day EUR/USD wiped out most of its gains and sank back down to near its open price. The next few days are important for the region. The details of Merkozy’s plan will be submitted to President Hermann Van Rompuy on Wednesday, while the EU leaders are also expected to make important decisions about the proposal during the EU Summit later this week. The problem, of course, is that European leaders are known for their lack of progress during such meetings. It is also difficult say whether all EU nations will agree to these new fiscal standards. Many of them would have to implement strict austerity measures. Heck, we all know how that’s gone down for Greece and Ireland. For now, we’ll have to wait and see what develops out of this week’s EU summit. Hopefully, progress will be made and we’ll be one step closer to getting out of this whole mess. Will we see any progress made at this week’s meetings?